Ulmarra has now become a much safer place in which to live thanks to the tireless efforts of a community that refused to give up. 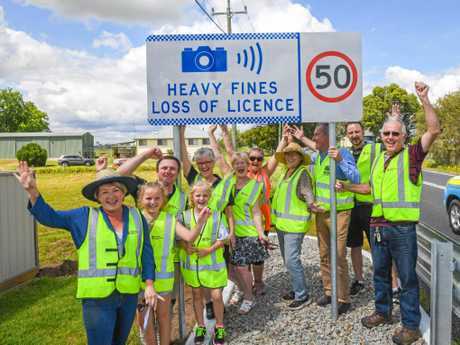 This morning, residents behind the Let's Not Wait campaign were given the honour of activating the first fixed speed camera in the Clarence Valley, which has been installed on the Pacific Highway at the southern end of the village. "To finally have a speed camera here, which is not easy to get, and to have the barriers, the speed zones, it's a pretty massive feat," resident and Let's Not Wait spokesperson Ryan Brown said. "I'm pretty happy and proud of everyone today." Ulmarra residents, The Daily Examiner and Member for Clarence Chris Gulaptis have been fighting for improved road safety measures following countless near-misses from highway crashes. "The Ulmarra community fought long and hard over many years to make their village a safer place and I am pleased their calls for a fixed speed camera have finally been realised," Mr Gulaptis said. In that time, those behind the Let's Not Wait campaign have been tested. Not only were Ryan Brown and his family thrust into the local and national media spotlight, they also became easy targets for harassment and intimidation by critics of the campaign. However, wife Krystal Brown said that these struggles pale in comparison to this morning's achievement. "The push and everything that's happened with us, everything that's come of it, the painful stuff that's come between us all, it's all been worth it," she said. "We won." The Browns, along with residents and tireless advocates Di and John Leask said the campaign has been the result of a group effort, from residents, the media, police to government officials. "It's been a whole village thing; everybody has pushed in their own way to help and that's what it's all been about," Mr Leask said. "The local media have worked with us and become part of our community and that's fabulous in itself." Mrs Leask said the speed camera now served as a symbol for people power in the community. "We've stood together and to see what any small village can achieve with people power is just fantastic," she said. "That camera being turned on today, that's just the icing on the cake."